DIRECT FROM LOURDES - Lourdes Water & Prayer Card Gift Set. 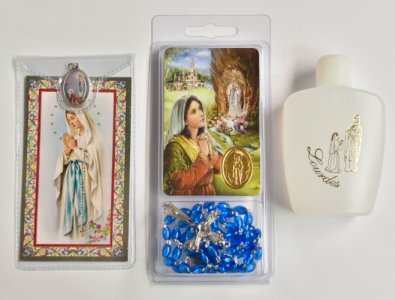 Lourdes Water & Prayer Card Gift Set. > Silver foil stamped novena to Our Lady with medal prayer card. > Lourdes water bottle, measures 8.5 cm tall (3.34 inches). > Blue plastic Lourdes rosary & laminated prayer card set with a gold foil embrossed medal and a novena on the reverse.